The Syd Barrett of literature has died. As reported yesterday, JD Salinger, literature’s most famous recluse, passed away at 91. Since Salinger largely vanished from the public eye, though not its imagination, before I was born, it’s hard to gauge his impact on my own writing. Salinger was tied to another author of a 1950’s classic in my mind, that being Jack Kerouac. The similarities are there. Both Holden Caufield and Sal Paradise were of the same era and, albiet at different points in their lives, trying to figure out what they wanted to be when they grew up. I read both The Catcher in the Rye and On the Road after I’d turned 40. Some would say I wouldn’t be able to get either book reading them so late in life. That’s not true, however. While I found Holden to be an annoying, self-centered brat who blames the rest of the world for disappointing him, it’s not like I didn’t go through that phase myself. And I had a happier adolescence than Holden. In the beginning, Holden realizes that people are putting up a front and starts calling them out on it. It’s not hard to sympathize with him. By the end of the novel, though, Holden doesn’t seem to realize he’s just as “phoney” as they people he accuses, using the epithet to lash out at anything and anyone he doesn’t like. Like I said, I don’t like the kid. I loved the novel. So I didn’t miss Kerouac. I do miss Salinger. There was always that hope that we’d find out Holden’s fate. Maybe we will if the estate opens up the vault. It’s possible Holden accepted his loss of innocence and became the forerunner of Gordon Gecko. Mitchell is a recently released convict who finds Billy Norton waiting for him on his first day of freedom. Billy’s arranged an apartment and a job for him. At a welcome home party his first night back, Mitchell meets a reporter who hooks him up with some honest work. Her aunt is a faded theater star who needs a handy man. Mitchell takes the job and finds himself servicing Lillian Palmer, the actress, in more ways than just fixing her mansion. When Billy’s boss, Tommy Logan, offers Mitchell a job, Mitchell turns him down. Suddenly, bodies start piling up around Mitchell. He doesn’t react with fear. He goes out to get even. London Boulevard is an early example of Ken Bruen’s sparse poetic style. There are flashes of the later Jack Taylor novels here, including Bruen’s love of lists and some of his trademark unspoken zingers. With Bruen still polishing his style, it becomes more obvious what disappears seamlessly into the Taylor novels, that even the lists are poetry. The story itself twists enough to keep the pages turning, which is good. The book is about to become a movie. On film, it will be impossible to catch that lyrical quality that raises even Bruen’s weakest work above the fray. On the screen, the story will be more about the characters, Mitchell, Billy, Mitchell’s loopy sister Briony, the sadistic Logan, and the deluded Lillian. Hopefully, the film’s director will focus on those parts of the story. In the meantime, Bruen’s narrative is still pure music, laced with cigarettes and whiskey like Rory Gallagher and Tom Waits. My belly is killing me. It doesn’t look all that big, though no one will argue whether I need to drop a few. The nature of belly fat is insidious. It’s not just what hangs out in front of you. It goes between all your internal organs and even into them. I risk a stroke tying my shoes. My blood sugar could be used to sweeten your coffee. My liver hates me and looks like I drink heavily more often than when the Bouchercon bar is open. OK, I do drink heavily more often than that. But not that often. My weight’s been up and down over the years, much of it because of a pizza delivery gig I held through most of the 1990’s. I’ve tried all sorts of things. I tried low-carb diets. I tried eating smaller meals more often. I even tried South Beach and had enough success with it to suggest others give it a try. Years ago, I had a doctor with some strange ideas. One of the things he told me was that calorie counting was madness. He then wrote a prescription for Prozac and told me the reduced stress and my enormous caffeine intake would combine to lower my weight. I gained 30 pounds, but I felt good about it. That doctor also left the practice shortly after I told him I wanted off the stuff. I have stress and rage, but not enough to warrant a chemical assist covered by my HMO. This year, I tried something radical. The weight’s coming down slowly, and I’m doing this because Nita is doing it. It’s easier when you do this with someone. We exercise regularly, but the calories really aren’t that hard to watch. I’m not surprised. The doctor who said they were also prescribed an anti-depressant for weight loss. I later learned those cause massive sugar cravings. To any shareholders of Coca-Cola in 1998, you’re welcome. The thing is this time out, I feel better. I’m not dropping massive amounts of weight in a hurry, and that’s good. Usually, when I drop a lot of weight fast, those pounds come back. And they bring friends with them. I make myself no promises. I just want those brown bottles out of my medicine cabinet. I don’t want to shoot insulin after every meal. (Haven’t had to yet. [Knocks on desk.]) More importantly, it’s been 16 years. I’m ready to kick blood pressure medication. I can only do that if there’s less of me to medicate. That said, I do miss eating whatever I want when I want. But I don’t miss my vision going dark when I bend over to tie my shoe. And my toes and I are reacquainted. God, they’ve let themselves go to hell. I have a confession to make. I’ve started writing in front of the television. Horrors, Jim! How could you? Simple. It’s winter. The floor in the basement, and my office as a result, is cold. And American Idol has started again. OK, that last one is lame. In a former life, no one thought twice about me fleeing to the Starbucks at the bottom of the hill to bang out a couple thousand words. Type. Drink coffee. Ogle scantily-clad MILFs sauntering in from the nearby Gold’s Gym. I’d sit in one of the comfy chairs and sip coffee while my muse poured prose into my head. It’s cold in the basement, and besides, my wife is upstairs. Sometimes, I get the impression I’m abandoning her. Already I have to come down here for long stretches to read books for review or do school work. Ah, the joys of being a middle-aged college student. So do I go back to the coffee shop to work on writing projects? In Deer Park, there is one mom-and-pop coffee bar, Buffalo Mountain. They closed in November when their lease ended. Last week, they reopened across the street in a smaller (ie – more cheaply rented) strip mall. “Free wireless!” the owner assured me when I dropped by for a cup of Sumatra. It’s a great alternative to Starbucks. I’d be supporting small business, and besides, the nearest Starbucks is in Kenwood. It’s a cramped location with a parking lot designed for the maximum number of fender benders. I suppose I could go to the Starbucks in the Barnes & Noble across the parking lot from the standalone one. However, there’s no place to plug in my laptop there (Yes, I’m too cheap to replace my dying battery. ), and I’d probably spend most of my time browsing the stacks and running up my Chase bill buying whatever caught my eye. So is it worth it spending $1.80 for coffee I can make at home cheaper? Do I need to man up and put on my slippers and a sweater? Do I need to spend more time with my wife and kid? All good questions. Some days, I do miss going to that Starbucks. I don’t missed the cramped apartment I lived in when I did. 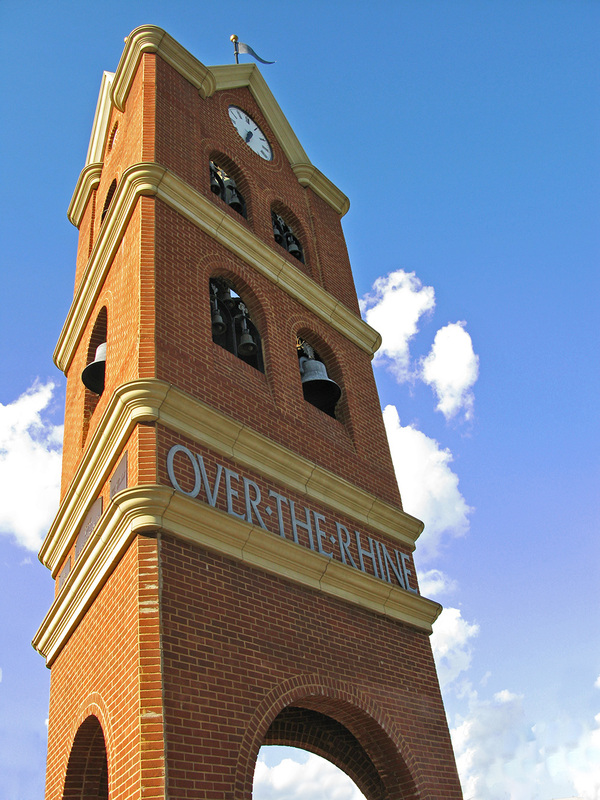 North of downtown lies Over the Rhine, a troubled neighborhood struggling to emerge from decades of decay. 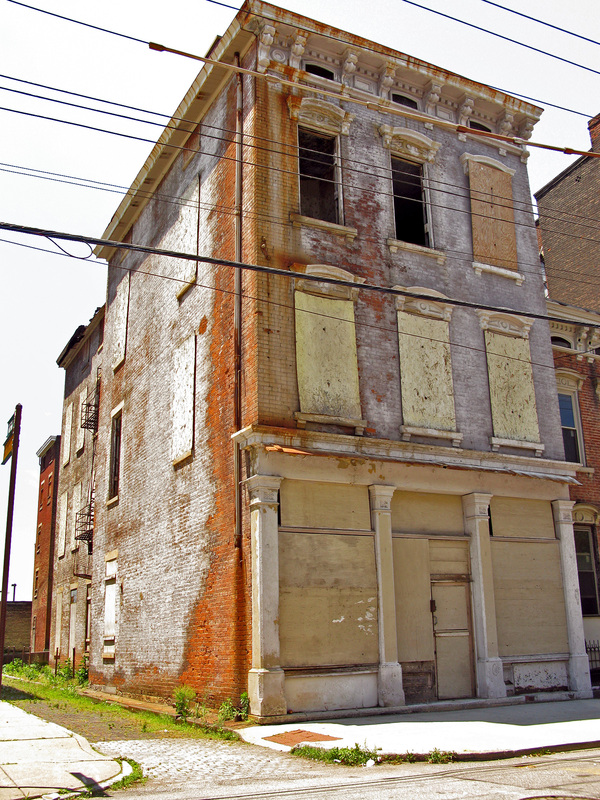 The neighborhood grew into one of the most extensive areas of Italianette architecture in the country. Many of the building built in the late 19th century remain intact to this day. 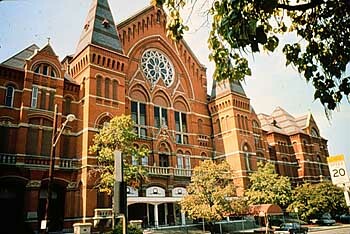 Above is Music Hall, OTR’s most prominent building and home to the Cincinnati Symphony, Cincinnati Pops, and Cincinnati Ballet. As you enter the front of the building, you can see the remains of the city’s old trolley system in the exposed brick beneath the asphalt. Dozens of churches, many of the Catholic or formerly Catholic, dot the neighborhood. Cincinnati’s German immigrant population is unusual for Ohio. In cities such as Columbus and Cleveland, Germans tended to be Protestant with Anabaptists migrating for the rural parts of the state. Amish and Mennonites are very common even in suburban areas in some parts of the state. In Cincinnati, however, the Germans tended to be Catholic and as recently as the nineties, some Catholic churches held German language masses. Unfortunately, there is also a lot of decay, some of it coming back. Slowly. In the early 1970’s, the area became depressed and returned to its roots as a ghetto. A battle ensued between historic preservationists and developers on one side and advocates for the poor on the other. 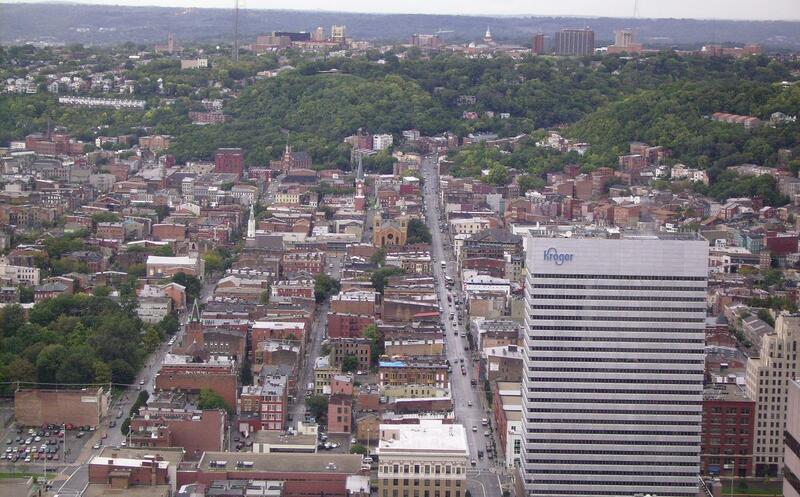 Developers like Jim Tarbell wanted to remake OTR into a trendy historic district. Buddy Gray, a social activist who turned his back on a career as a high-powered attorney, wanted the neighborhood to be a sanctuary for the poor. Gray died in the 90’s, however, sadly murdered by one of the people he had tried to help. The neighborhood began to turn around with the Main Street corridor becoming the city’s premier night spot and a technical center called “Digital Rhine” sprouting up during the tech boom of the 1990’s. The race riots of 2001 caused development to grind to a halt. Change eventually began again, but slowly, with the Vine Street corridor the focus now. Condos have sprouted up in former warehouses and converted tenements and hotels. A casino is planned for Broadway Commons, once a leading candidate for what is now Great American Ballpark. A somewhat controversial plan to build a street car system between downtown through the neighborhood and up to “Pill Hill” is also expected to spur development. Voters rejected a charter amendment designed to block the project (ironically not paid for out of city income taxes but from government grants). With financing in place and the casino project moving forward, Over the Rhine is on the verge of a new chapter in its history. More at My Town Mondays. Nick and Todd grew up together in Brooklyn, working for an Irish thug named Boyle. Nick can’t believe how ruthless Todd has become. Todd tries to reign in Nick’s blind rage. Most shocking of all, Todd’s actually a cop. And Boyle wants Nick to kill him. The opening scene depicting Todd dumping Boyle’s right-hand man, an ex-IRA shooter named Griffin, into the East River, suggests no. What happens leading up to that final confrontation is pure Bruen-driven rage laced with Coleman’s poetic lines about sorrow and loss. The tower in the title is the North Tower of the World Trade Center, where Nick’s father is a security guard. The tower looms over the story the way it once loomed over Manhattan, its end marking the end of the story as well. The climax is a classic Bruen punch in the gut rivaling the ending to The Dramatist. The denouement echoes Coleman’s reflections on loss and carrying on after the fact.